Man oh man I HATE the stupid conning tower! 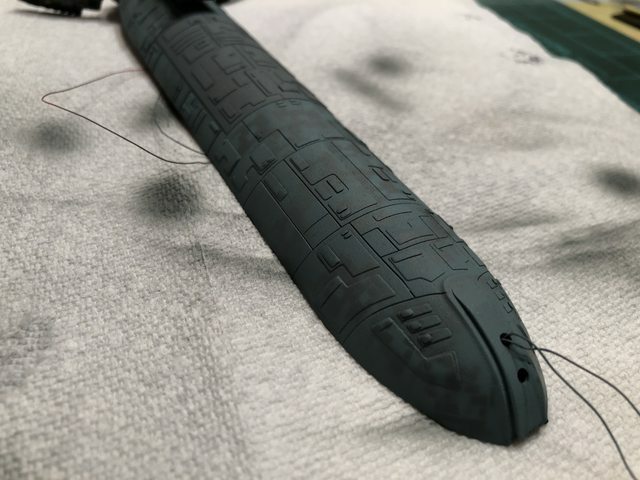 I cannot get a decent paint job on it to save my life. I need to sand most of the paint off the top yet again. 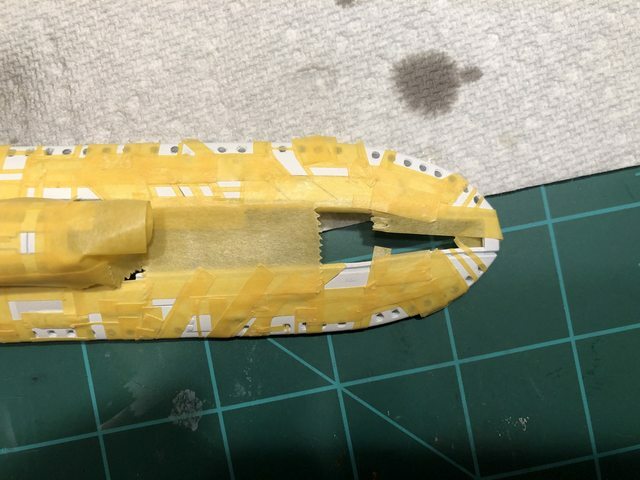 Anyway, no pics of that horror show, but I have been working on some homemade aztecing for the white upper hull. 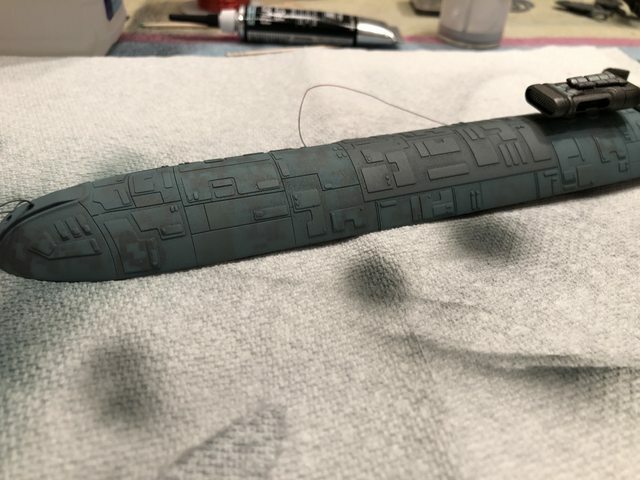 Once the conning tower has a respectable base coat on it I will do some aztecing on there as well. These are showing up a little brighter than in real life, and after another pass to fill in a few more spots with aztecing I will do a mist of white to blend even more. But depending on the angle they are very subtle. Base coat is Vallejo Dead White and the aztecing is Testors Aztek Pearl. 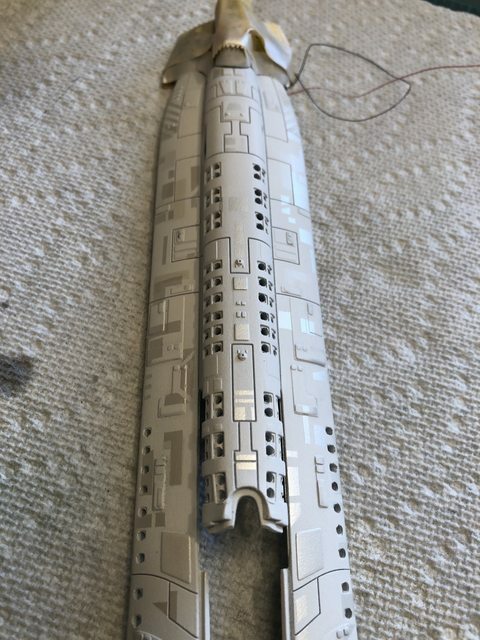 I have experimented with a more "industrial" type of aztecing for the lower hull and have done one successful test shot. 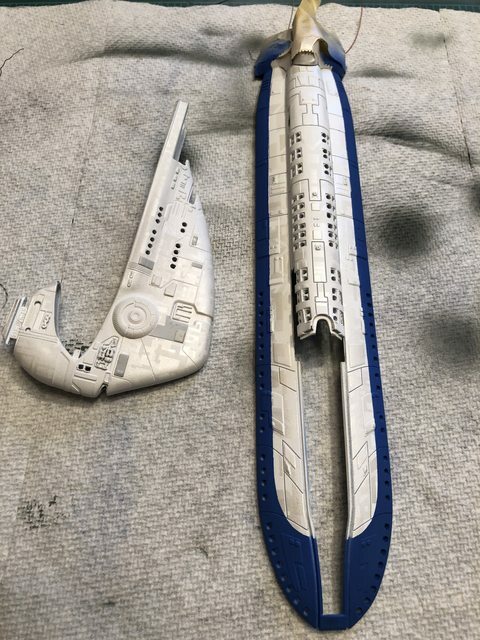 I will post pics of that once it's done. I did a round two of aztecing today. This is almost done. 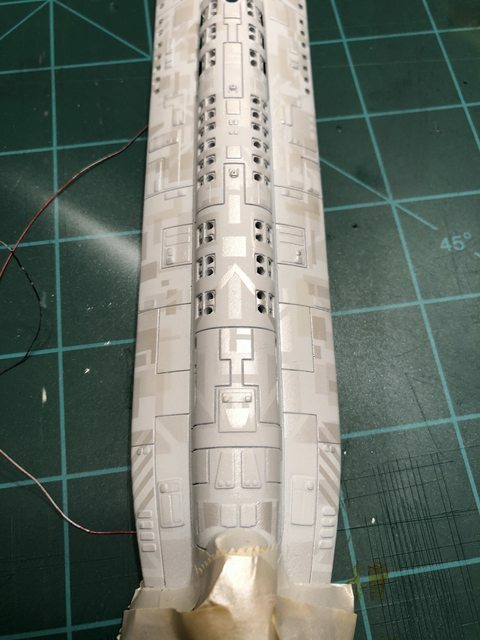 I think I need to do a little more toward the front of the hull but I'm considering everything else finished. All of this taping is as tedious as it looks. The visibility is definitely dependent on how the light hits it, which is exactly what I wanted. It changes from fairly bright to nearly invisible depending on the angle. And my screwup number 3,421. 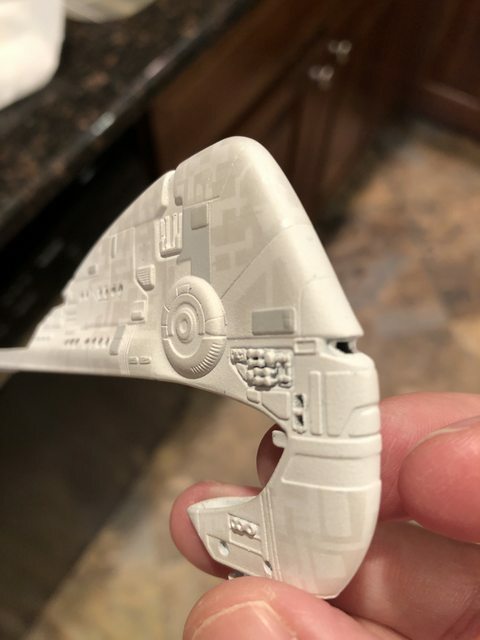 Somehow I accidentally managed to melt part of the lower hull. 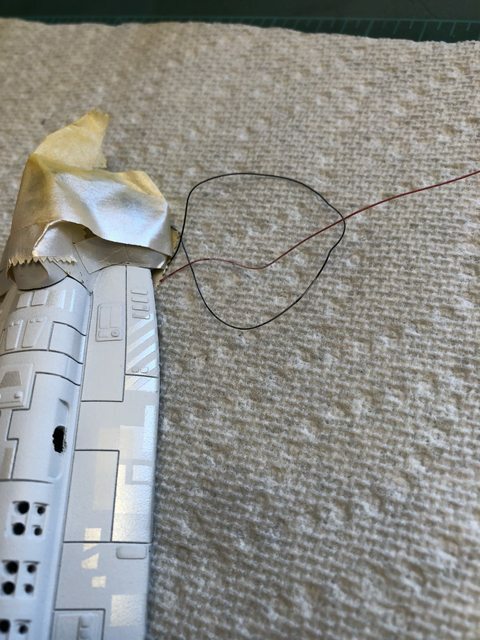 It looks like my soldering iron is the culprit but I have no idea how. I am in the middle of puttying and sanding in the hope of salvaging it. 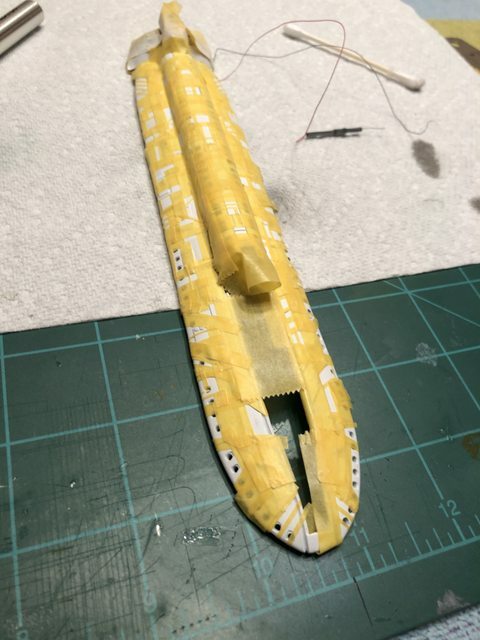 The "industrial" aztec test for the lower hull. The color is off but the pattern is what's important and I like how it came out. Again, I was going for subtle because this model is not very large. Hang in there, Buddy! Speaking as one who knows screwup numbers and thinks your 3,421 is kinda low, compared to my own, I know you will recover from this and all screwups. 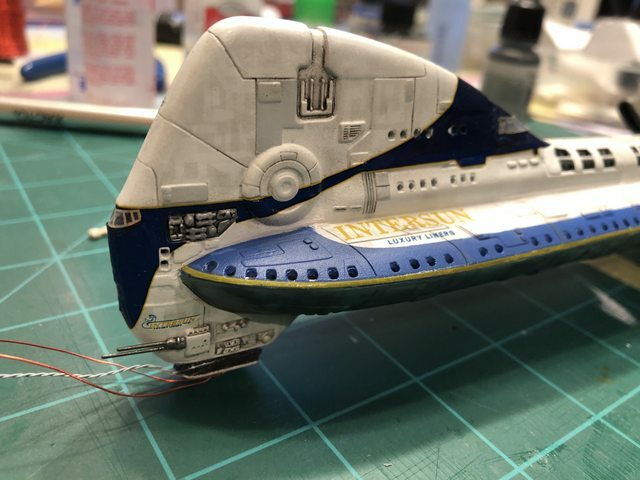 I firmly believe that perseverance is a character trait all modelers possess in abundance. The only hobbiests who have it in greater quantities are those who play golf. I was gonna say your aztecing on the hull looks fabulous! I did something similar on my NSEA Protector. Your's, however is, IMHO well done. 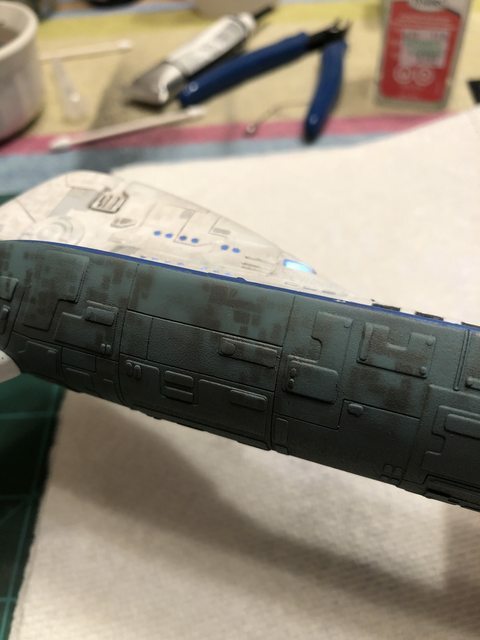 If this is just the hull, I can't wait to see the rest of the ship! Hang in there and push through. It'll be awesome! Thanks, Steve. I wish I knew how it got melted! I was horrified when I saw it. 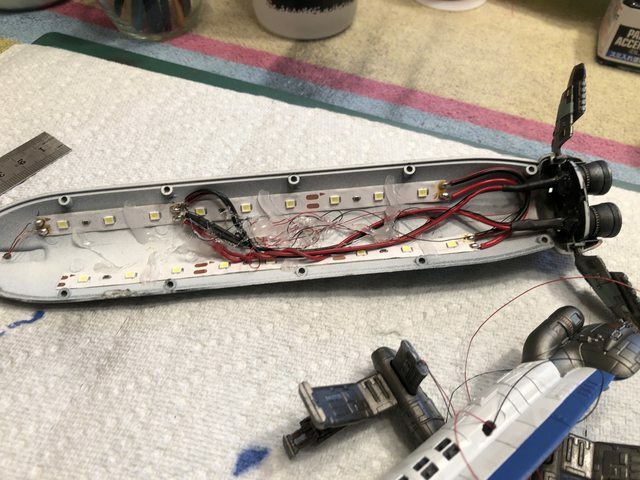 I have an extra lower hull (I needed a second kit because of an earlier screw up that wasn't fixable) but I had already glued in the engines, side engine deflectors, and soldered a bunch of the lights together. Taking it apart would be awful. 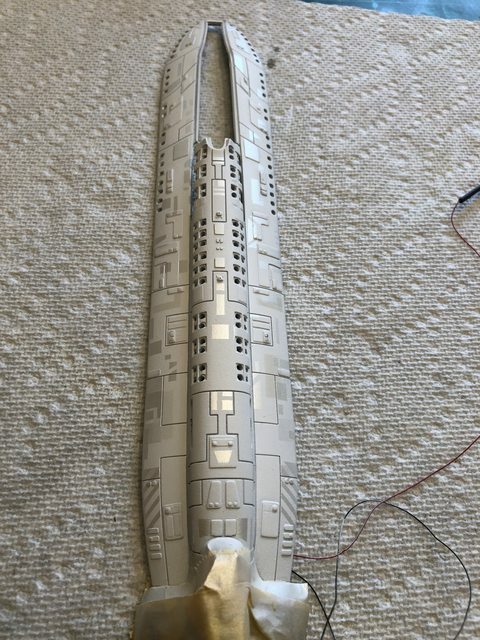 So I'm going to try to fix it. If I can't, I still have the spare to fall back on (But I think this is salvageable). 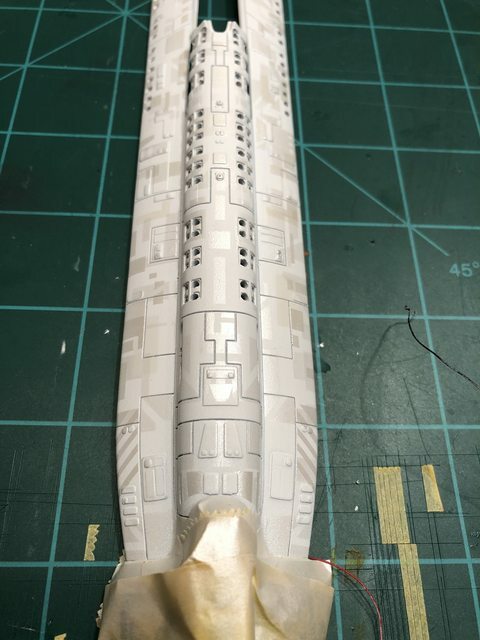 The upper hull aztecing is done. It's very hard to photograph. Using a flash helps (the last photos) but in real life the pattern is not so nearly pronounced. More aztecing... (sigh). Man is this tedious work. First pass at the conning tower aztecing. 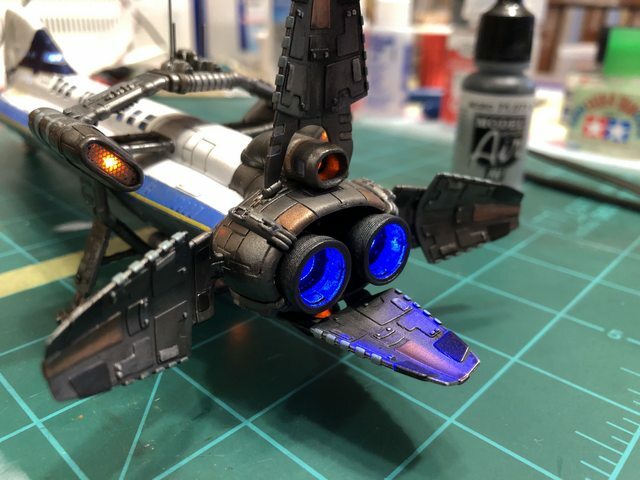 This was done with lots and lots of Tamiya tape sliced up with an x-acto knife. Lower hull aztecing. This was done a little differently. 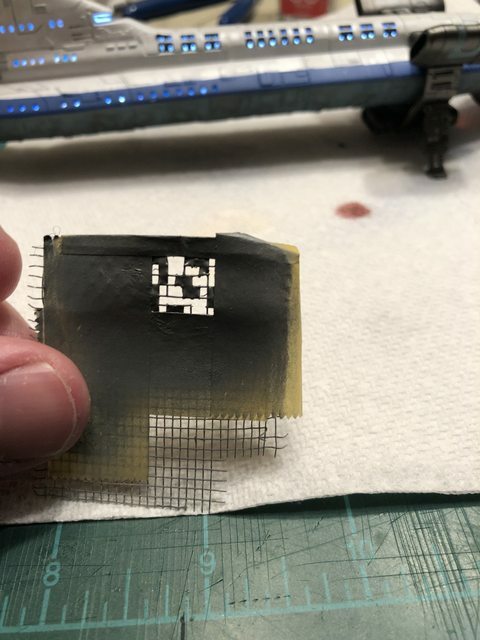 I took a piece of screen door replacement, used liquid mask to fill some of the screen holes, then cut out others to make a template mask that I could hold down over the model and spray. 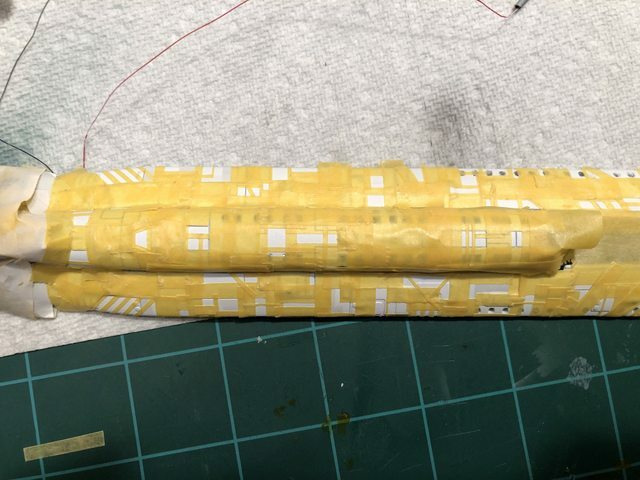 It's maybe half an inch square with tape around the edge to make a frame or sorts. 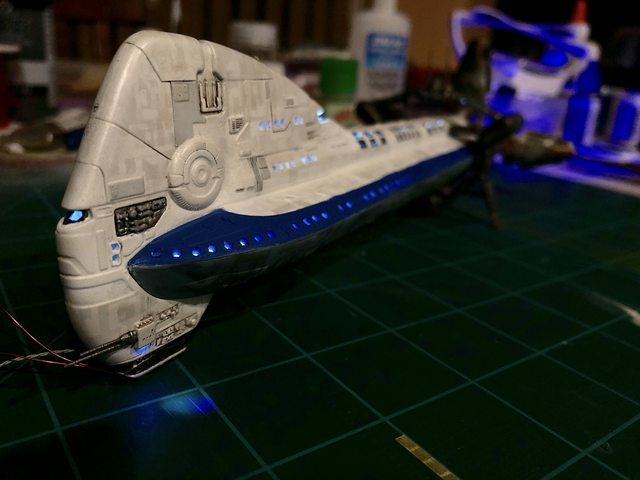 So why didn't I do this on the upper hull? Because the edges are kid of fuzzy. I tried an experiment and it didn't look as good. But here I am ok with a more industrial kind of look. The flash on the phone camera makes them stand out more than they do in person. Minor update while I fight an awful sinus cold. Oh, my aching head...! 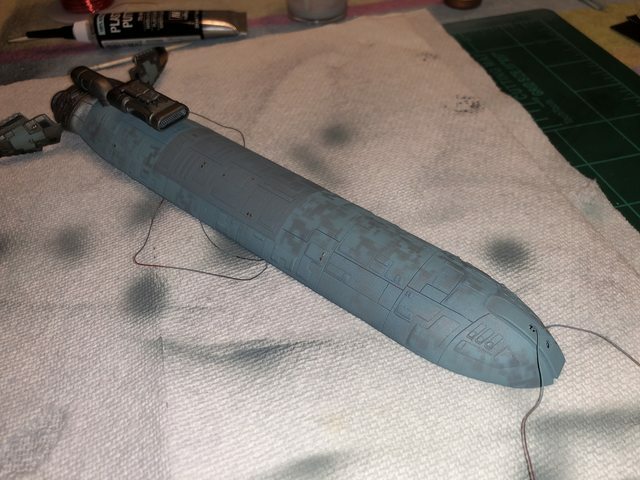 A little more paint work done on the conning tower, and I painted the blue stripes on the upper main fuselage. 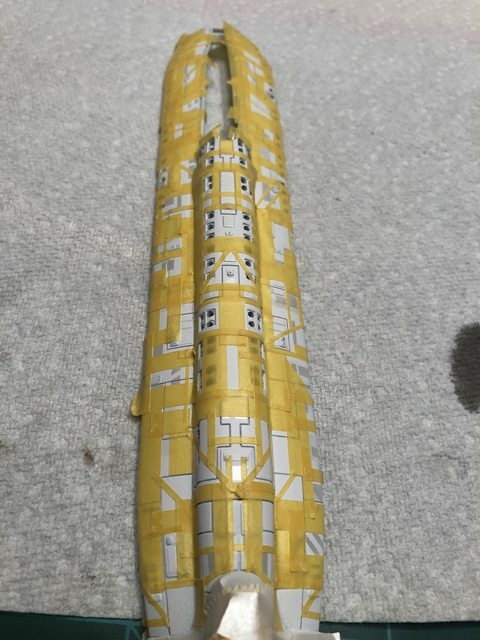 I decided to paint them rather than use the decals because I have heard there are fit problems with them. I am pretty happy with how it came out. 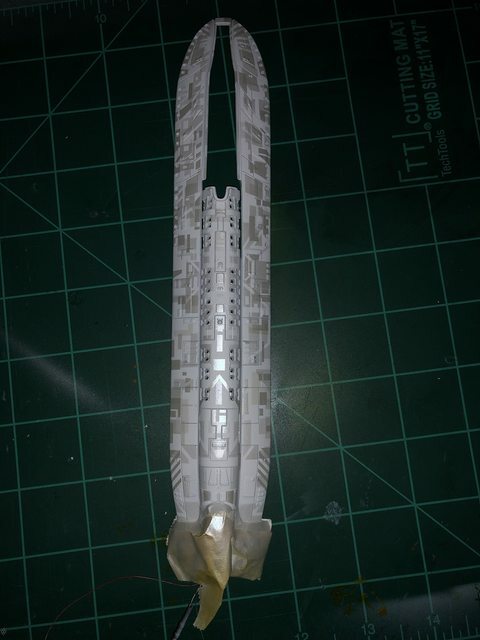 The curved parts were just freehand X-acto cuts on Tamiya tape. Did them in one try! Thanks. I'm finally feeling better. Coming down the home stretch (I hope!). 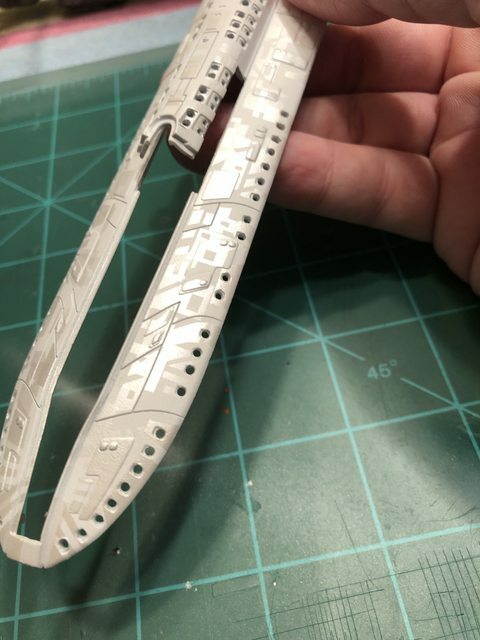 A little piece of window screen that I used as a template for the aztecing on the bottom of the hull. I cut some pieces of of the screen and blocked others with liquid mask. 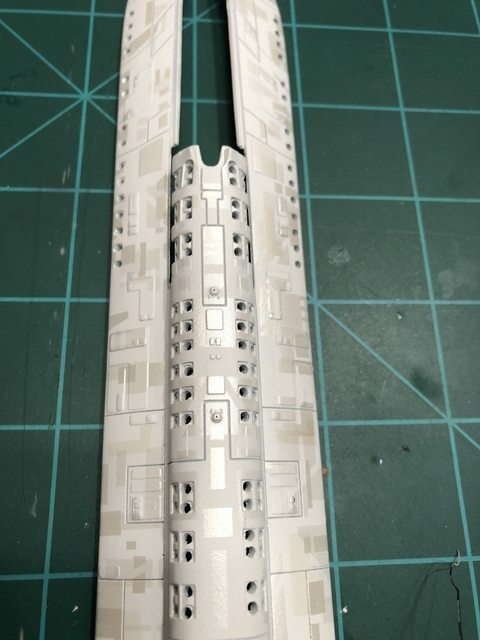 All glued together except for the cockpit and observation deck windows, which will be dead last. Great work all around . Just a quick gripe but the decals on this are terrible. 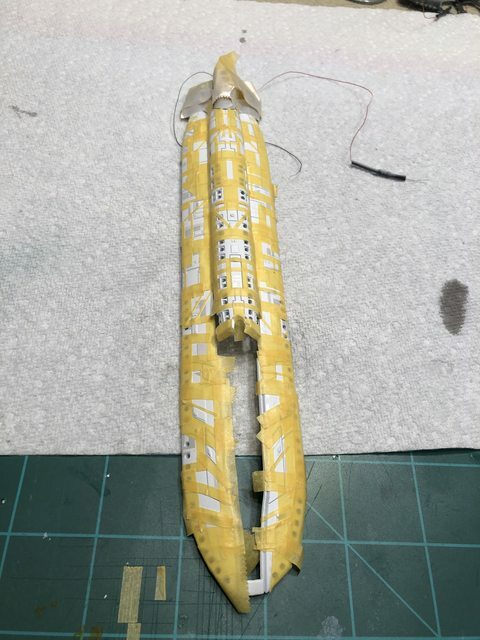 There is no way I can find to make the blue bands around the conning tower line up. Just terrible. It looks like I'm going to have to mask and paint, which I did not want to do. 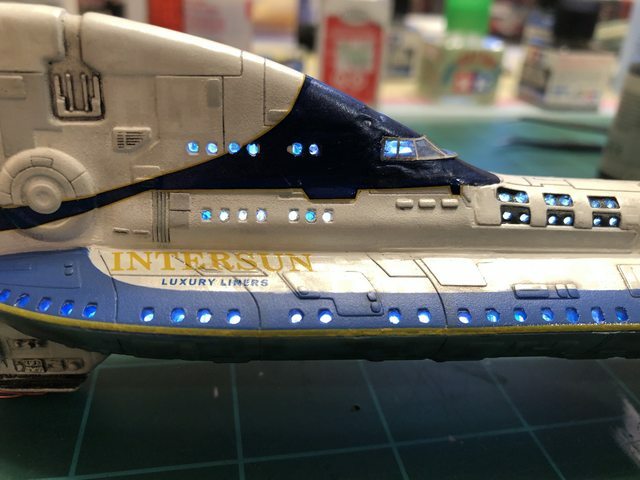 Everything is sealed, light blocked, and the decals have been applied. 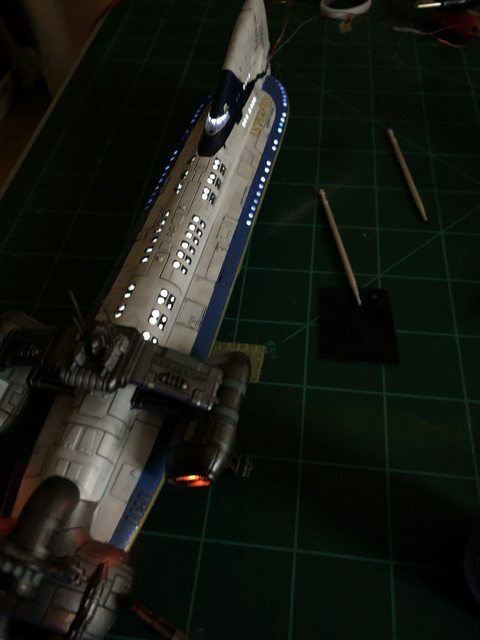 I need to do some touch up work to the decals on the rear of the conning tower (more on that below), then add Micro Krystal Klear to the windows, dull coat, and then fix to the base. 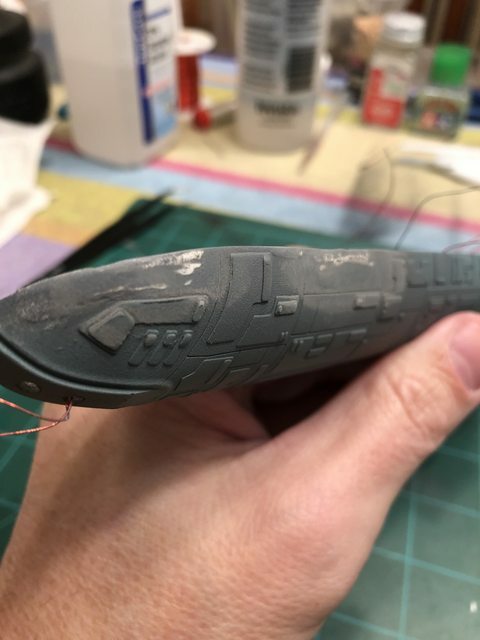 I only lightly weathered the ship, mostly because of the scale. I didn't want it too dirtied up. 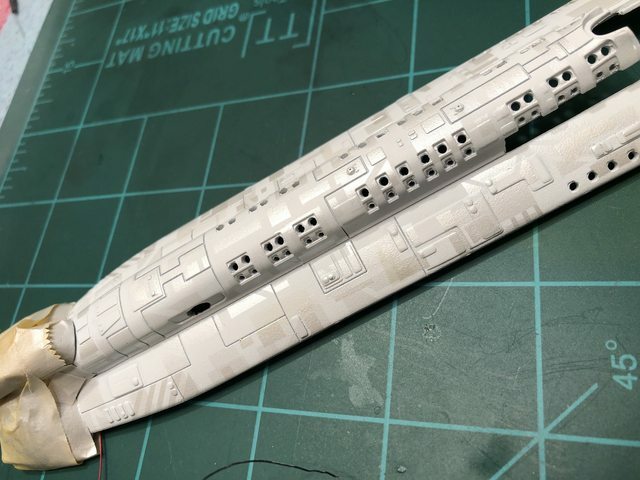 I did use a light panel line wash and some scorching around the engines, and weathered the lower hull a bit heavier than the upper based on atmospheric descent and the resulting scorching. 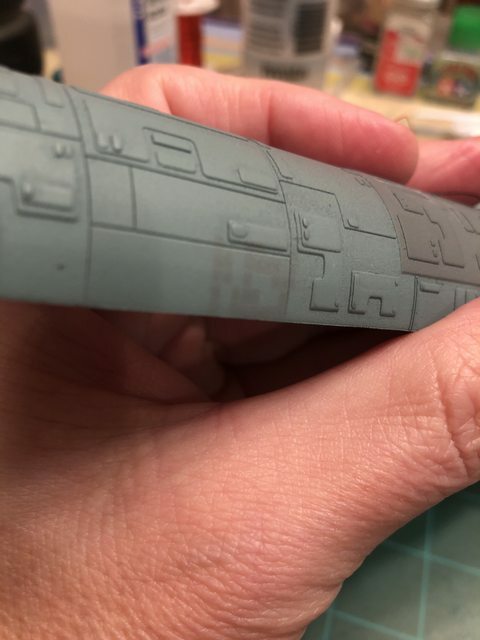 The decals in this kit are TERRIBLE. 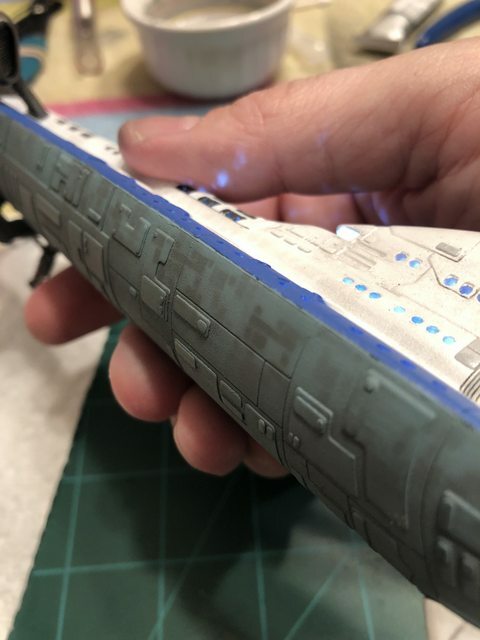 I didn't even bother with the blue along the upper hull since I heard it didn't fit correctly, but the the conning tower decals are a mess. 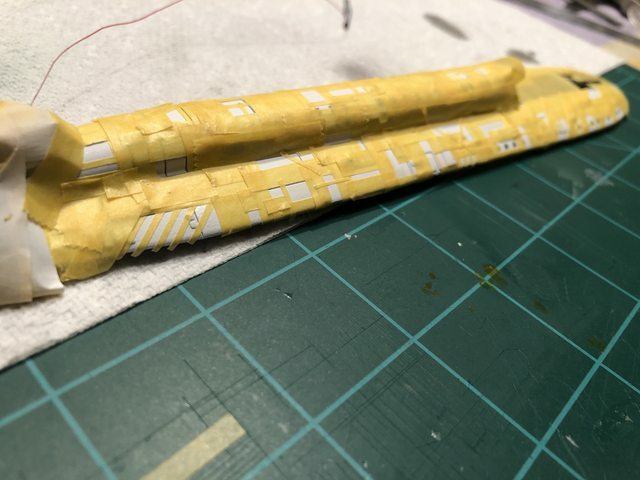 The yellow stripe is okay but you have to cut it into pieces -- there is no way to lay that all on as a single piece. 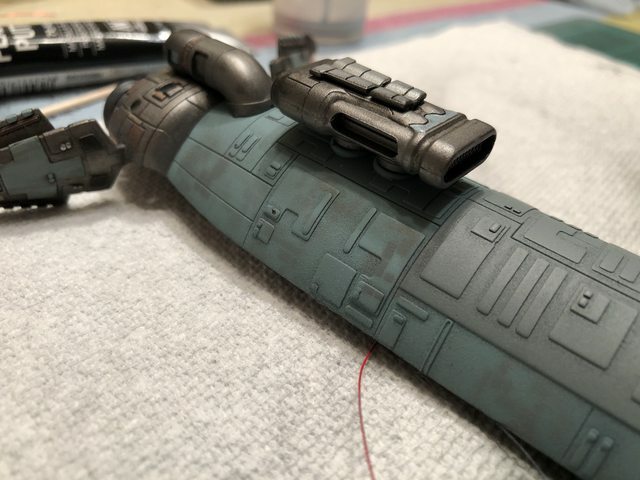 The rear conning tower decals around the observation deck DO NOT FIT. There is simply no way to make them stretch enough, and the gap is not small. I had to use paint to close it up, which still needs a bit of touch up. They are simply sized way off. 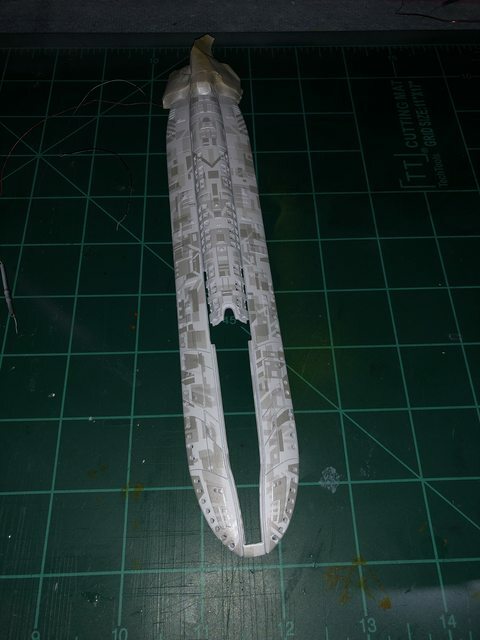 The lower edge should be horizontal and parallel to the length of the hull below the observation deck. That simply is not possible. 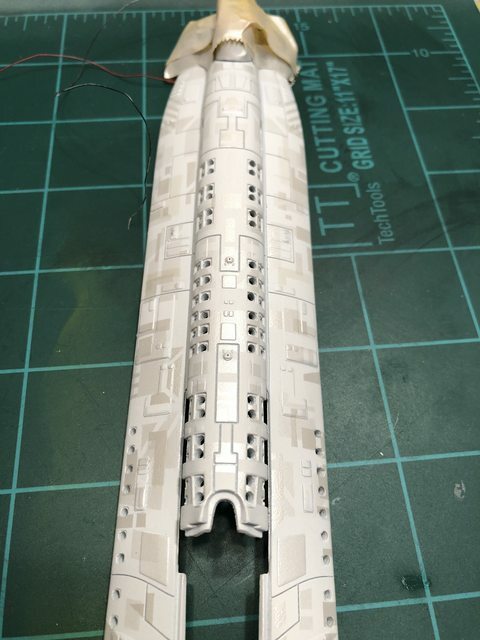 Even if you curve it way up so it is now incorrect and looks wrong, there is still a gap, and there is one along the upper edge above the deck windows as well. It's just a lousy decal. I need to fix the observation deck windows. 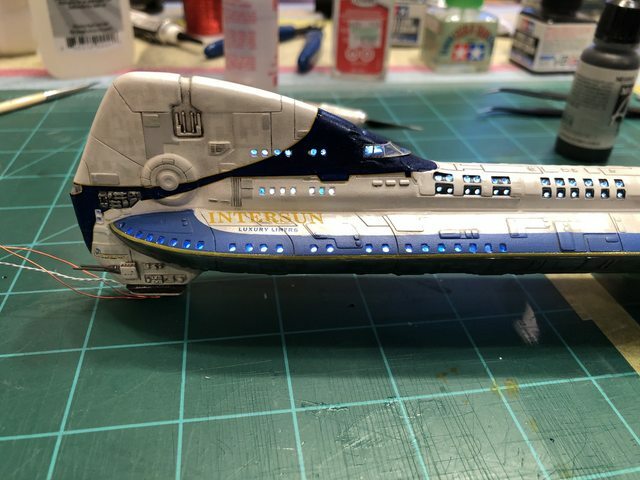 The problem is this ship is just too small for any details to show. I do like the variation in color so not everything is brilliant white, but at this scale you just can't get any details to show. Really nice work. Is she all done ? Almost done. I got the Krystal Klear in for the windows. 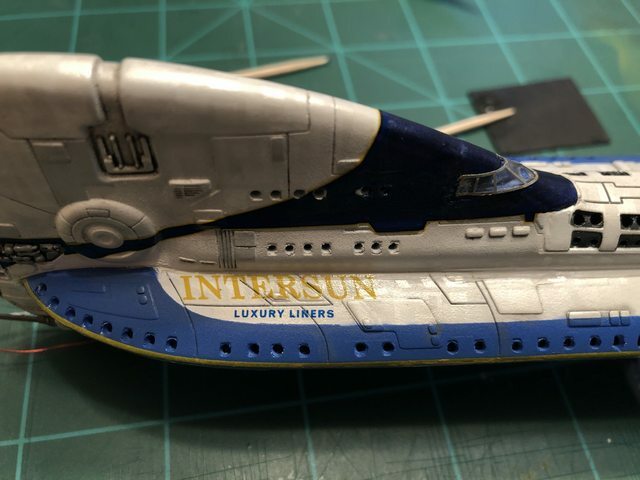 I ruined the decal that goes on the front of the conning tower so I am trying to get a replacement set from Moebius. 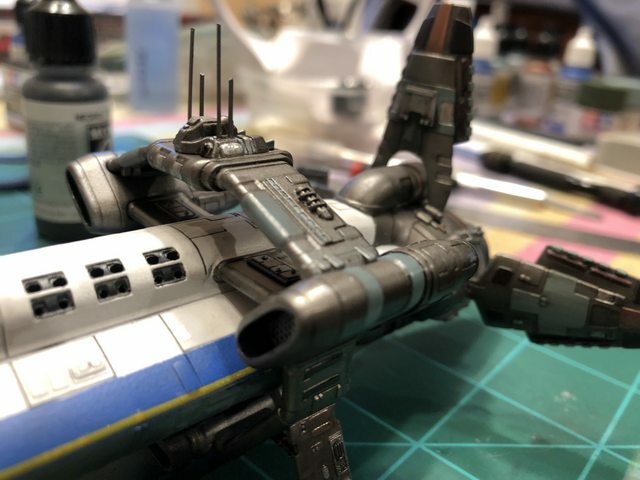 I am redoing the observation deck windows (I have a second set of the Paragrafix FE) and I need to figure out how to best touch up the paint over the decal on the rear of the conning tower where the decals didn't meet. But close. Very close.